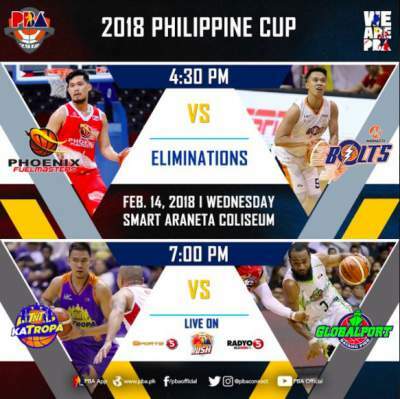 Here is the details for Phoenix Fuel Masters vs. Meralco Bolts in the elimination round of 2018 PBA Philippine Cup. Garvo Lanete scored a season high 24 points while vCliff Hodge, who injured his left knee in the third quarter, added 17 markers to give the Meralco Bolts a 92-90 victory over the Phoenix Fuel Masters. Willy Wilson paced Phoenix with 24 points. Matthew Wright tallied 16 points for Fuel Masters, who dropped to 4-5 record. The win upped the Bolts record to 3-6. MERALCO 92 -- Lanete 24, Hodge 17, Tolomia 9, Newsome 9, Canaleta 9, Caram 9, Hugnatan 6, Amer 5, Salva 4, Ballesteros 0, Baracael 0. PHOENIX 90 -- Wilson 24, Wright 16, Jazul 13, Perkins 10, Chan 8, Mendoza 6, Dehesa 5, Intal 4, Kramer 4, Gamboa 0, Alolino 0, Chua 0. Watch the highlights of the Meralco Bolts 90-92 win over the Phoenix Fuel Masters on February 14.